According to BBC News, U.S. loses long held top position as world's primary engine for technology innovation (BBC News http://news.bbc.co.uk/2/6502725.stm). 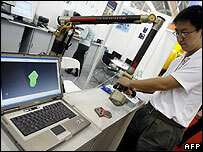 The Networked Readiness Index published by the World Economic Forum (WEF) and Insead. You can read the entire article at BBC News. The article explains what types of paramerters the WEF uses to judge countries. If you've been anywhere on the planet, chances are you saw or heard something about the controversial Clinton / Obama YouTube video titled 1984 Vote Different; posted by Phil de Vellis on March 5 (AKA parkridge47). By my estimates, a few million alpha types went to YouTube directly while somewhere between 150 to 250 million likely caught it on the "OldTube" in the U.S. alone. I would not be surprised if the awareness of the video reaches a billion people in some form. Amazing! What you saw is a classical example of viral marketing. A week later, the buzz about the video continues. The rerun factor was the main attraction on the Sunday morning political talk shows. There was very little substance in the analysis. Nobody went beyond the YouTube experience. Nobody explored viral marketing or the strategic implications to the traditional two party system. I did not see any indication that the talk show hosts understood the real difference between the various forms of word of mouth marketing (WOM) nor the fundamental message being delivered by the creator of the video (on Huffington Post). I happen to be reading Connected Marketing by Justin Kirby & Paul Marsden (ISBN-10: 0-7506-6634-X, ISBN-13: 978-0750666343), when the 1984 YouTube video first came out sometime around March 5th. The first time I watched the video, I sensed we might be at a magic moment Malcolm Gladwell calls tipping point. I spent some time looking at WOM marketing from a more academic and theoretical perspective. 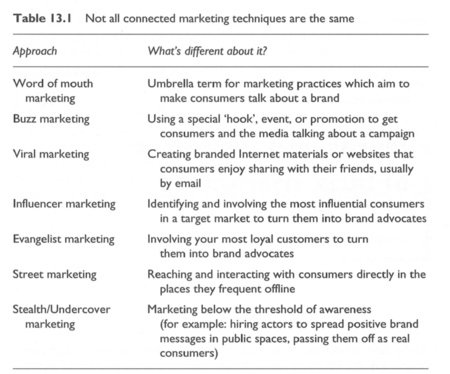 I thought I would post a blog this week for those who are not familiar with word of mouth marketing (WOM). Moreover, I wanted to look at the sociopolitical and commercial implications of WOM marketing. By no means is this post intended to be a primer on WOM. It certainly would do justice. Nor is my intent to compare / contrast The Tipping Point by Malcolm Gladwell to some of the other books like The Anatomy of Buzz and Connected Marketing. I just want to stimulate a deeper examination of this relatively new form of marketing and point you to some excellent resources. What are the different WOM marketing techniques? Are WOM marketing, buzz marketing, and viral marketing all the same thing? Why does WOM marketing fundamentally work? Can a WOM marketing campaign be scripted or do they simply happen? Can WOM marketing be used for b2b? Is WOM marketing only for trend setting products/services? Can WOM marketing be used for an established brand? Can WOM marketing be used for a non-product / service related things? How about an idea, opinion, or "igniting" something that becomes defined by the ad? I'll touch on some of these areas. If we accept the premise that traditional network and the underlying business model is dead and moving to the internet (paid TV advertisement), maybe there is a more effective new way of reaching key voter demographics. Sociopolitical implications: Could YouTube and other digital multimedia social websites further fragment the younger demographics or will it coalesce and unify them into a single voice that can breakup the two party system? Thomas Friedman, might ask - are we seeing the democratization of the presidential campaign machinery. Is this the end of the two party system, as we know it? I think the tables are about to turn for presidential campaign managers. The internet and advent of e-commerce changed the legacy push model to a pull model and shifted purchasing power towards the consumer. Perhaps we are seeing a similar paradigm shift in presidential campaigning. Instead of worrying about getting the message out to constituents, maybe the constituents have discovered an ingenious way of changing the rules. Instead of getting the campaign message out, maybe the community drives the message and the campaign. I think Phil's clever video gave us all the same immediate gut wrenching reaction. Is this for real?! Are you kidding me! Who created this? It almost had a liberating sensation. Wow! Could this be the end of paid campaign commercials created by candidates, as we know it? Thanks for proving a great point. Now anyone can make a video ad and have a free channel to broadcast it out to millions. I guess you don't need millions to produce and broadcast a 30 second spot. It does not even have to be for a product or service. As the 1984 video demonstrated, a WOM ad could be for an idea or opinion. Could the 1984 video be that tipping point? Is this the new marketing paradigm? With the advent of Tivo and other filtering devices, we have learned how to block ads. Now it appears, we are taking control of creating those very ads. Instead of being at the receive end of message the candidates are trying to put out (push), perhaps the networked voting community can form a formidable representation of a message it wants to project (pull). That would be a radical change. I bet the pundits and campaign managers are scrambling to get themselves up to speed on the various types of word of mouth marketing (WOM). The more connected are probably strategizing about the implications. Phil de Vellis clearly stated his intent in the March 21sth Huffington Post. As Phil pointed out, the digital medium is not exclusive to anyone. YouTube provides a frictionless platform (distribution channel) to reach a significant audience. Anyone with a PC and some basic multimedia editing skills can create a short media event that captures and / or ignites a popular view, opinion, trend, culture, or idea. As Phil showed us, it does not cost anything, but a few hours and lots of imagination. Truly innovative! Could this be the "disintermediation" of the presidential campaign process, as we know it? The discussions, outcomes, and possibilities are endless. 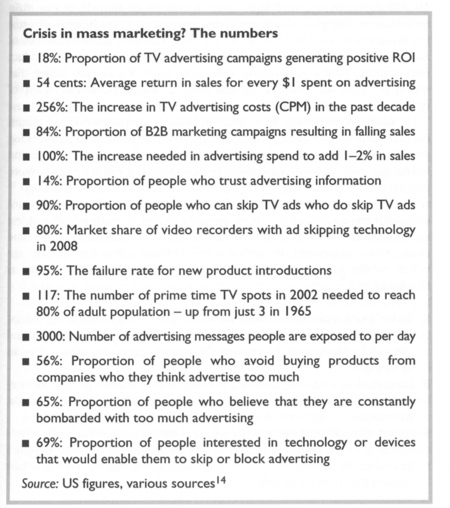 Grab yourself a copy of Connected Marketing or The Anatomy of Buzz for an in depth study of these issues. I highly recommend Connected Marketing to anyone who is marketing professional or MBA type. Based on the number of clearly listed peer-reviewed references at the end of each chapter, I would say Connected Marketing is a good candidate for academicians. I am not sure if I answered all of the questions. The only constant you can count on is change. If you're in a leadership capacity, it might be a good idea to heed to the advice of change management gurus when it comes to engaging your employees. Managing change in an organization takes on many dimensions. Depending on the nature and urgency of the need to change, it can involve behavioral, organizational, structural, functional, technological, or procedural planned changes (Judith R. Gordon). Moreover, the degree or urgency of the organizational change varies on the particular situation. Sometime the organizational change can be a slight policy change. On the other extreme, a more radical response is required (Gordon). A good example of the latter would be a venture backed start-up organization that is lucky enough to get a "green light" for a restart from the board (a/k/a second chance). In this scenario, you can typically see the leadership team pay the ultimate price. Change by nature creates conflicts, which in turn create opposing forces against the intended changes. Ironically, opposing forces come from employees perceptions stemming from lack of information. In short, misperceptions are one of the root causes for opposing forces. Get you employees involved in the decision making process. Get them to understand the constraint, problem, situation, or need for whatever improvement you are seeking to make. More importantly, get them involved in the solution. In doing so, they become stakeholders. As most studies show, asking someone's recommendation or advice goes a long way towards creating deep interest. Communicate the change plan. With increasing flat and remote workforce, clear communication is essential. In the best or worst of circumstances, engagement is the best strategy to align the forces towards change. Warning!! Investors are chasing growth again. So is this good or bad for tech? According to an article in yesterday's Wall Street Journal titled "Tech Companies Bleeding Red Ink Pursue IPO Gold: Hungry Investors Accept Growth Instead of Profit" most of the tech firms in the pipeline for this year are in the red. "A number of unprofitable companies have launched initial public offering in U.S…since the beginning of 2006"
Back in 1999, 87% of tech IPOs had no profits. "The proportion of unprofitable tech companies grew in 2006." "Six of 13 tech IPOs in the fourth quarter" were unprofitable. All three tech IPOs in Q1 of this year (07) are unprofitable. 62% of companies that have filed their S1 with the SEC for an IPO since 2005 are unprofitable (Thomson Financial). This certainly cannot be healthy for companies and the innovators in this sector in the long run. Last thing we need is an industry that is perceived as being in one big contact cycle. Looks like the investment community is gearing up to purge some of the backlog. Why Do So Many Products & Companies Fail? Do companies in the innovation business fail at a higher rate because of their inability to create good ideas? Or does it have to do with poor management, process, and execution? By some estimates, 90% to 97% of all new products fail. Since, there is a direct connection between innovation and execution, I thought I would list some of my own observations. You can download and read the complete description for each one from my website (innovator's dilemma). 1. Ad hoc new product development. 4. No strategic planning or mapping process. 6. Lack of performance tools. 9. Ineffective or absent lead user methodology. 12. Creating more marketplace gaps. 14. Not invented here syndrome. 15. Genetic makeup and culture. 18. No or deficient business model. The pressure to innovate has less to do with the dot.com bubble or internet and more to do with new sources of competitive advantage. As Thomas L. Friedman would say, it has more to do with the other 4 billion people on the planet who are quickly coming online in the new global economy. The incumbent manufacturing hemispheres no longer have the least cost producer advantage. As these western countries and regions abandon manufacturing for more scientific and services sector, strategic innovation becomes the new source of competitive advantage. However, this new strategy does not change the fact that we are a risk averse society by nature. Trying to change an inherently risk averse business culture and managing innovation dates back at least a century. Thomas J. Watson, Thomas Edison, and Albert Einstein all understood that to find the next breakthrough idea one had to be willing to fail serially towards the optimum solution or discovery. We have plenty of bright individuals, ideas, and capital. We need to create a work environment that stimulates creativity and experimentation without negative consequences. Moreover, we need to teach our kids and workforce to understand the truly positive dimensions of thinking, tinkering, experimenting, and removing any societal stigmas on failing. I am not sure if the series will explore the root causes and challenges behind innovation. The first episode spent too much time focusing on individual iconoclasts and a risk averse business culture. Moreover, the choice of sponsor (IBM) suggests the audience is big business. I'll get into why innovation is an even bigger challenge for big business in another posting. You can watch the March 4th episode and judge for yourself. Series podcast. As you view the series, remind yourself that innovation is not just about another Apple iPod, a widget, piece of software, or some other new gadget. Innovation is any new idea or process that meets, creates, or transforms a social need in a positive way. My own views are more in line with academicians like Gareth R. Jones. Innovation is not just about creating new products or services. Innovation is about any new idea and not just a new product. Innovation in process can often bring about a revolutionary change. Innovation is not limited to one person or some department. The best ideas are the simplest ones. Innovation has more to do with thinking originally, and sometimes driving new social needs. Innovation can apply to way you create markets, sell, price, market, or advertise. To create a change culture, an organization must be willing to cannibalize its own business strategy. If you can figure a better business model, then you should pursue it. Otherwise, someone else will for you. You have to be proactively challenging your own success every day. Often the best ideas come from individuals or organizations that have no ties to the organization. So don't discount your customers, users, and even competitors. Some of the biggest market leaders like Microsoft, Oracle, and Cisco Systems have innovation acquisition best practices. Harnessing and managing innovation has more to do with organizational culture and values. If you would like to learn more about challenges organizations face managing innovation, check out a couple of classical organizational textbooks used in business schools. One of them is Organizational Theory: Design and Change by Gareth R. Jones. Another is Organizational Behavior: A Diagnostic Approach by Judith R. Gordon. Welcome to my blog. More aptly…"our blog." I'm still finding my way around this blog publishing service. I thought it would be appropriate to tell you more about myself and the theme I have in mind behind this blog. During the course of my career in the tech industry and recent client engagements, I have come to realize that organizations have a tendency towards using experiences as a basis of making most decisions. I call this the "when all you have is a hammer…everything starts looking like a nail" syndrome. Others refer to this as cognitive biases. Could this be the reason why 90%+ of all product initiatives fail and 70% of strategic initiatives fall short of their intended objective? Moreover, I see fewer organizations applying some of the principals and frameworks developed by folks like Porter, Drucker, Grant, Kotler, Goldratt, Senge, and others. I'm analytical and a builder by nature. I believe a little planning and preparation goes a long way. The kinetics may slow you down a little at the beginning, but the dividends are reduced risk. We all have biases. I'm certainly no exception. I don't share the view that long term business success – in the context of innovation - is predicated on technology and innovation. Moreover, I do not agree with those who place absolute significance on the creation aspect of innovation and discount business process innovation, alignment, marketing, social changes, and a strategic plan. The ability to create without alignment to a social context does not create a value or solve some problem. A lot more cognitive process and business methodologies go into building a sustainable business model. Innovation alone does not guarantee a sustainable strategy. I'm not exactly sure of this tipping point. Somewhere in the late 90s, technology started to cannibalize itself. My inspiration for creating this blog is to create a rich virtual meeting place for those who seek to apply a higher level of critical thinking to discuss new innovative ideas, strategies, practices, business models, marketing techniques, technologies, companies, start-ups, products, services, investments, and other matters of interest to those with a passion to innovate. Sometimes an outside perspective is the best one. I chose the name "innovation" for the blog to underscore the creation of something new. I don't necessarily consider the efficiencies of cost (producing something cheaper) as strategic innovation. Whether you are a business major, MBA student, marketer, aspiring entrepreneur, serial entrepreneur, executive, business owner, VC, professional, or curious intellectual, I hope there is something of value.